Android Emulator – a software for Windows which implements Android system functional and allows to run apps and games for it in an isolated environment. Modern Android emulators allow you to not only implement full support for mobile systems on the computer, but also to simulate most of the functions of real handheld devices. For example, it can emulate the camera (if you have a Web camera on a PC), position transducer device or touch screen. The advance of the most emulators is the support of the binding of the most functions to pressing certain keyboard keys, that makes it easier, for example, to control the games. There is an Android 4.4.2 (KitKat) emulator Nox App Player which has all the above advantages on the page below. 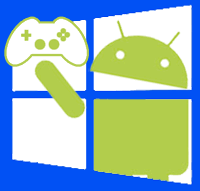 Android emulator: Windroye Free Android emulator for games and apps playing on PC.